Tiffanie and Troy met over 22 years ago at a mall, and have been madly in love ever since. They have one daughter, who is a proud member of the U.S. Navy. 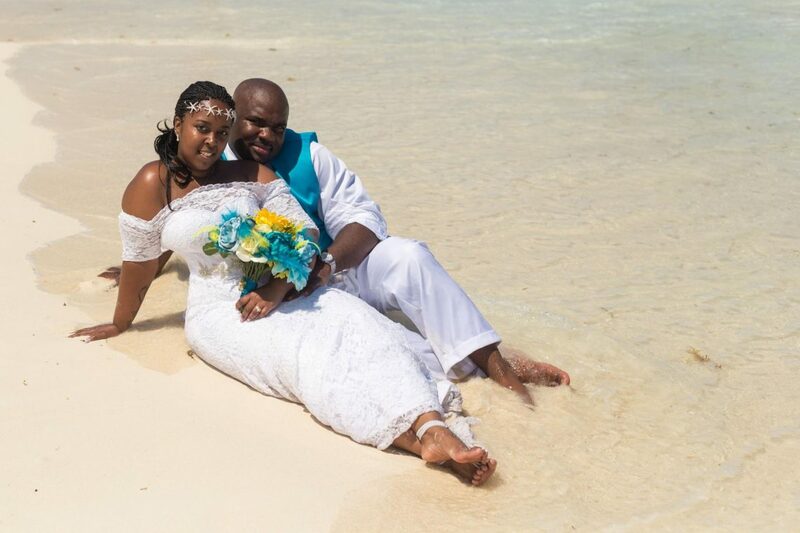 Since they already hosted a big formal wedding some years back, they decided to renew their vows in a Caribbean destination, and an intimate tropical ceremony sounded perfect. The vow renewal was originally meant to be just for the two of them, but later they decided to extend an invitation to close family and friends. Tiffanie focused on things she could do at home, like buying a wedding dress and choosing a theme. She searched everywhere for the perfect dress but wasn’t happy with anything she found. Luckily for her, Troy knows her well and surprised her with a custom wedding dress that fit her like a glove. He saved the day! He also chose the wedding colors by accident. After getting vetoes for her first color choices by Troy, she decided on navy and yellow as the wedding colors to honor their daughter. A miscommunication with Troy led to him ordering his boutonniere in turquoise and yellow. Tiffanie ran with it and used it as the wedding’s inspiration, adding her own touch by incorporating starfish throughout. Tiffanie and Troy arrived two days before their wedding and met with Patti Ulloa, the wedding coordinator, the next morning. They were able to have a cake tasting and finalize all the last-minute ceremony details. They then got to spend their free time enjoying the resort and going on excursions! Patti led the Masseys from start to finish. Tiffanie got ready in her father’s suite with his help and Patti’s. She wore a fitted, off-the-shoulder lace gown, accessorized with a silver starfish belt and matching headband. The wedding setup was stunning! A burlap aisle runner lined with starfish led to a beautiful dark wooden arbor wrapped in white fabric, the focal point. Patti thoughtfully set up two extra chairs to represent loved ones unable to attend. Everything worked out perfectly for Tiffanie and Troy! They took full advantage of their trip, spent six days in Mexico, participated in excursions, and turned their wedding into a honeymoon. They enjoyed a couple’s massage, which also turned out to be Troy’s first ever massage and served as a birthday gift for him. Their guests used the vacation as a chance to celebrate their wedding anniversary, and the entire trip proved to be a celebration of love. I could not have asked for a more perfect week, I didn’t want to come home!